Anyway please VOTE ....it's without a doubt, one of the most important things you can do. Sure, sometimes it feels like just one more vote wouldn't matter...but I guess the way I look at it is, without you in the process...makin' choices, it's just not the same, cuz' it makes me think you don't believe in the system...that somehow you think it's broke....and really it's not, if your there, ya'know? Get a little red, white, and U....when yer done click here! Oh...do you think that woman is dressed as a Mocha Mocha or a Caramel Mocha? my wife is a poll worker too...we are very proud! I might be early, ya'know? Looks like she's a mocha mocha, though it's kinda tough to tell from this angle. She's a mocha mocha! Everyone here at HQ are voting early but me. 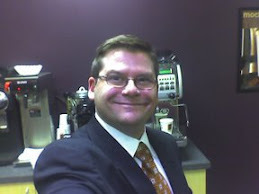 I will have the coffee ready and vote after work! Our team will need the coffee after the lines. 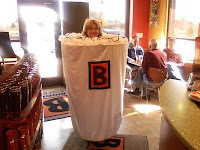 Totally mocha mocha ... now dressing up like your favorite BIGGBY drink takes some serious dedication! 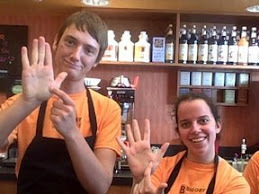 Now that's a BIGGBY COFFEE fanatic! Outstanding! Is that the Byron Center Ave. store? I hope she got a free drink for her efforts! If only she would have showed up to vote in her Carmel Marvel suit. No offense Cathy, but is that what people vote for, so they can have the "right" to complain? I have heard this many times " if you don't vote then you cant complain." So it sounds like everyone KNOWS any person elected will end up ultimately failing, but you must vote in order to have an opinion about it! Whats the point when we already know they will never bring about REAL change! I don't vote because humans are not equipped to rule the earth, EVERY person in office has proved that.They cannot solve the basic issues such as war and hunger. I chose not to vote, not because i don't care, quite the opposite actually. There are other ways to get involved. I just refuse to follow the "norm" and vote for someone i don't believe in just for the sake of voting. If you ask me you should find a better reason to vote other then complaining rights. By saying that, you admit that the system already failed. Sorry , i don't mean to make this a political thing, but there are many of us that don't vote for this very reason and we never get our voices heard, I guess that's because this point of view is not considered "appreciating having our American freedom. " That could not be farther from the truth. yes, but on the costume? Mocha Mocha of Mocha Caramel?